We fearlessly use our computers or laptops and forget the fact that everything is being tracked. If you are using a Windows 10 computer which is logged in from a Microsoft account having access to multiple users then you should know that you are compromising on your privacy Your activity history can be viewed by other users having access to the same Microsoft account. Changing Microsoft account password is a better option but in certain circumstances you cannot change the password. So it is a better idea to view and delete your Activity history. Here is how you can clear your activity history on your Microsoft account because we understand that unlawful access to your personal data can lead to embarrassment. First you need to navigate to Settings. You can do this by clicking Windows icon and then clicking on settings Button. On the home page of settings menu, you will see Privacy It will be second last option. When you will open privacy options in settings you will see “Manage my info that’s stored in the cloud” click on it. You will be redirected to Microsoft account’s privacy page. You need to login on this page with the same Microsoft account on your computer. Once you are logged in you will be able to see different activity sections such as search history, browsing history, Location activity, Voice activity, Cortana’ Notebook etc. With all these sections, you will find buttons to Edit data or to clear the stored data. If you do not want to clear the whole data you can individually clear Activity for the given sections. On this page, you can also view some other important details of your Microsoft account such as billing information order history Address book. 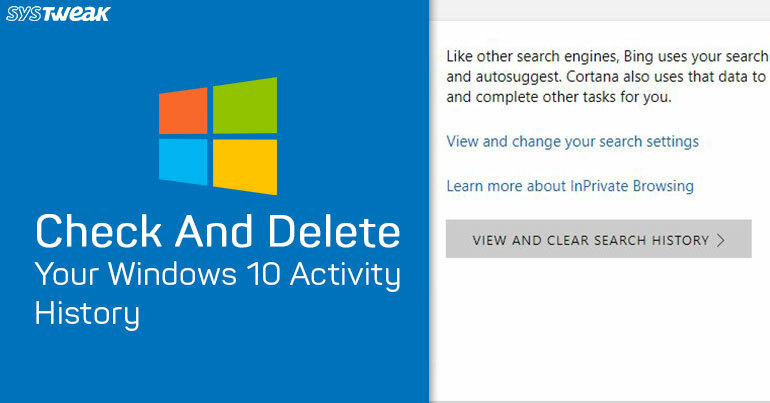 This is how you can safely remove activity data from your Microsoft account. Apart from this on the Microsoft account page you can also edit your info and can check your security settings. Microsoft save this data to enhance the user experience. Knowing your choices and preferences makes it easier for to show you the stuff you are looking for quickly and with lesser effort.